The next Certificate will be held in March 2019. A full programme and online booking will be available soon. This three-day Certificate programme, run with the support of Brunel University London, is designed to equip you with the essential management tools to deliver a successful occupational health service. The programme builds on professional training, and develops the additional skills needed to function effectively in the working environment in the private or public sector. The Certificate in Managing OH Services is organised by The At Work Partnership with the support of Brunel University London and is designed to provide you with management skills and expertise. The course deals with the financial, political, legal and employment issues that OH professionals need to address in order to ensure that they function successfully and deliver maximum benefit to their employer. 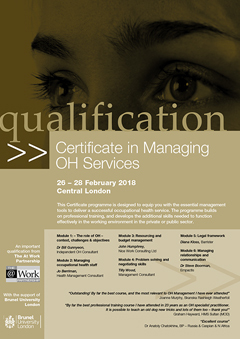 This certificate provides OH and allied professionals with the essential management tools they need to deliver a successful OH service– from the effective management of staff and programmes to managing departmental budgets – with a clear understanding of corporate and financial objectives, the organisation’s legal responsibilities and the needs of different stakeholders. The course equips you with the skills to create an OH service that meets the needs of your employer and where departmental performance is constantly monitored and improved. The certificate enables OH professionals to operate confidently within the workplace, whether public or private sector, and to present the case for OH to different stakeholders. Occupational health professionals attending this course will come away with the knowledge to manage their department with confidence, financial acumen, legal awareness and the wider management skills to develop their department’s work. The course is designed for occupational physicians, occupational health nurses, case managers, health and safety professionals, human resources managers and other professionals involved in the delivery and management of occupational health services. “By far the best professional training course I have attended in 23 years as an OH specialist practitioner.